I am so grateful that I live in Indonesia where wearing hijab is not a problem at all for other people and often seen as good woman when someone wearing hijab. It is so sad to know that some of sisters out there have to stay at home all day because wearing hijab is forbidden. Some of them are really brave that they still wearing hijab even though they have to face bad consequences from people around them. I know that Allah SWT must be love them so much. For me wearing hijab is more than a rule for Muslim women. Hijab is one of Allah way to show how much He love women. He wants us to be protected, not only physically but also mentally. For me hijab is such a reminder to do the good and to avoid me to do the bad things. Hijab is also an identity for Muslim women, people will recognize that a woman is Muslim when she is wearing hijab. Your hijab donation will be distributed to Yayasan Putri Bunda, Jl. Kebon Genep, Dramaga, Bogor. I believe that you have so many hijab in different colors, style, and materials. Let's donate some of your hijab for our sisters in Bogor. 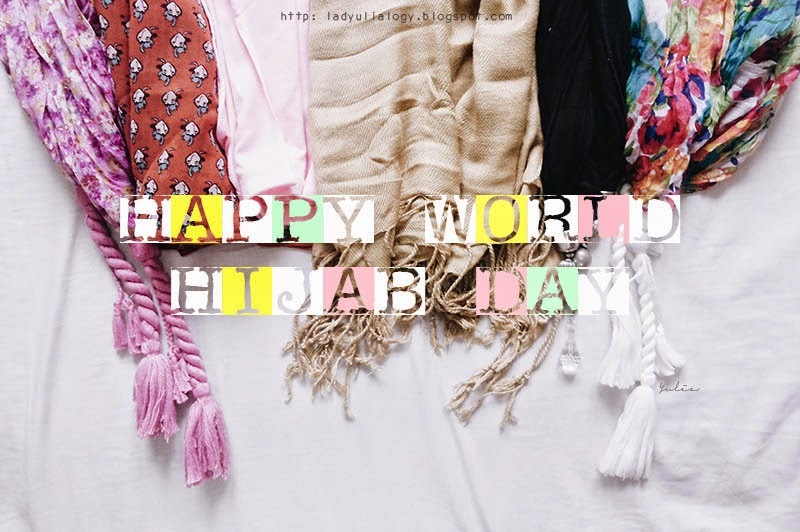 Let's celebrate this World Hijab Day together in faith and happiness. Hope your wish will be fulfilled. I think that apart from government offices and institutions of justice which ought to be neutral, women and men, wherever in the world they are in the public domain,(should)have the right to wear or not to wear whatever they want to express their specific convictions - of course including hijab and yarmulke or similar symbols. @Colson: Yes, as long as the religion symbols wear by someone does not reduce his/her performance and not harm others in the offices or institution.